I’m not saying you should ever target, or be happy with, only delivering to some of the people you send an email campaign to but a delivery rate of 100% will rarely (never) be achieved. Bad email addresses will always cause issues but lower delivery rates aren’t necessarily related to the quality of the email addresses being used. More than likely there will be other factors in play that stop emails from being delivered. When an email can’t be delivered, the destination mail server will return an “SMTP” response that indicates why it’s not prepared to accept the message at that time. Dealing with bounced emails starts way before you get anywhere near the send button. Do what works best for you but definitely think about using an email campaign checklist so you can tick everything off as you go and as a result send email campaigns with real confidence. Taking the correct approach may also result in your email campaigns being delivered faster as sender reputation builds. The term “bounced” is just another way of describing an email that cannot be delivered. Emails can get bounced on the first delivery attempt but at other times they might hang around in the mail queues being retried for a number of days – retrying may result in the message finally being delivered but it could also still result in it being bounced. Instiller processes bounced emails automatically based on SMTP responses. Using that info each undeliverable email is categorised as a “hard” or “soft” bounce and is classified further within that to be more specific about the reason why the email was not accepted by the mail server. An example hard bounce classification would be something terminal like “bad-mailbox” which basically means the user doesn’t exist so there’s nowhere to send the email. Soft bounces are generally temporary and classifications will be things like “quota-issues” (the mailbox is full) or “spam-related” (the email has been classified as spam). We show a complete analysis of hard and soft bounces with our campaign reports. At first the info may seem a little daunting but in our experience we’ve found that it’s always worth downloading the data and using Excel or Numbers (or whatever) to take a look at the most common SMTP responses returned. 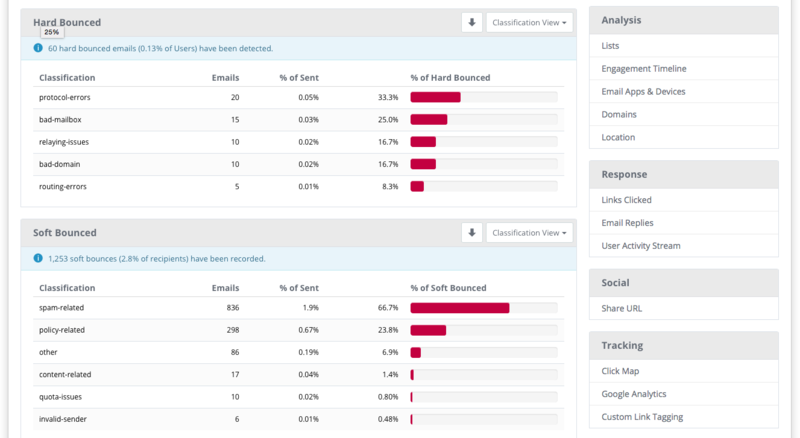 After glancing over the messages contained in your bounce reports you will start to see patterns and notice that some contain additional links and information to help you combat whatever issue is causing the bounce. 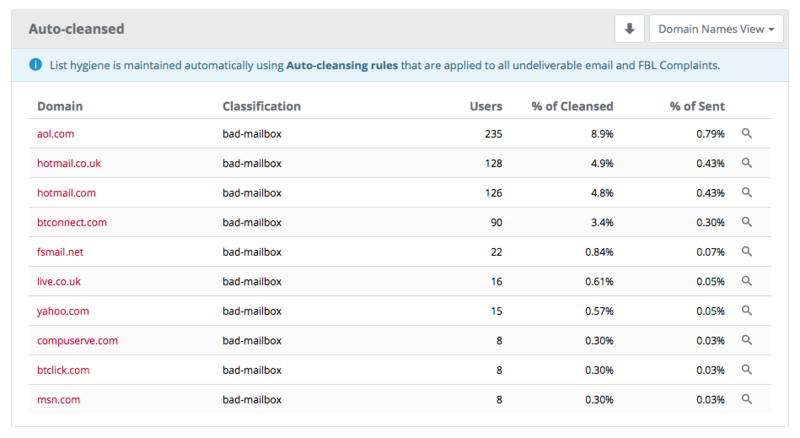 Lists need to be clean, that’s a fact of email marketing. What’s the point in trying to send a message to an email address you know doesn’t exist? We all know the answer and what’s important is to ensure that you have a process in place that removes email addresses from your lists based on the type of hard or soft bounces they are identified as. We have a set of rules within Instiller that automatically get applied after each delivery attempt. For bad-mailbox it’s one bounce and your out, for a soft bounce like quota-issues it’ll take 5 consecutive bounced campaigns for a user before they are opted-out. There’s a default rule-set which 99% of our agencies use but some alter the threshold for each type of bounce classification. Don’t always expect people that don’t want your email to click the opt-out link to email you and demand they be removed from your lists. Some will prefer the anonymous approach of marketing an email as “junk”, when people do this you need to make sure you’ve got everything in place to deal with happens next. If someone thinks your email is junk, and they’ve told you so by clicking a button in their email app, then don’t send them any further emails. This is what Feedback Loops are for and they provide a way of capturing the event of anyone marking your emails as junk to provide you with an opportunity of removing them from your lists. Most Feedback Loops determine where to send complaint notifications to using the sending IP address but the exception is Yahoo! – it’s very important that you register all of your sending domains with them directly. Think of your sending domain as an ID badge that you show to the mail server when presenting it with a load of emails you want delivered. If you don’t check out, the messages won’t be allowed in. Every mail server will expect email authentication in place so don’t avoid getting this part sorted – it’s not difficult and it also protects the people you are sending emails to. We put together this handy guide to help with health checking every sending domain. It’s common for mail providers to use services that check whether the IP addresses or domains detected in emails that are received appear on blacklists. Being listed on blacklists can result in bounced emails and that’s one of the reasons why Instiller provides a full report on 80 of the most frequently used blacklists, however there are many more blacklists in operation than this. For this reason it is important to check your bounce reports for any signs of blacklistings that haven’t been picked up on. Senders can always learn something from being blacklisted so never think it’s enough to focus on getting delisted. Always investigate what the source of the issue was and resolve that – if you don’t, you’ll be making a re-appearance on that blacklist again very soon! Return Path produce a Sender Score for IP addresses and that’s always a good place to look if you are concerned about the number of emails being bounced. No email marketer wants Spam traps but unfortunately they can still pop-up on your lists. Even if you’re sure there are no Spam traps on your lists it’s still worth getting a better understanding of what they are and what you can put in place in an attempt to avoid them in the future. This is obvious but… don’t forget that Spam looks and sounds like Spam. Mail filters love sniffing out Spam-like content and they’ll happily bounce your emails without ever getting tired of doing so.